Kickstop HingeGuard Plates are used to reinforce and strengthen a wooden door frame adjacent to the hinge. Hinges are an often overlooked area of door security and a traditional inward opening door will fail if enough force is applied to the hinge side of the door. 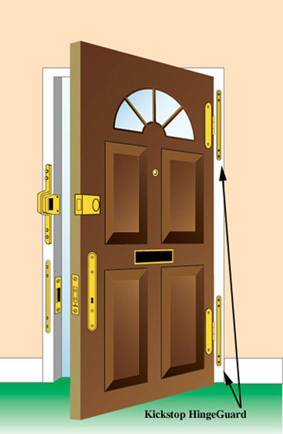 The Hinge Plates (two per pack) are screwed on to the internal face of the door frame, just next to the hinge, and will resist a 'kick-in' attack and forced entry and so help avoid a burglary. HingeGuard Plates are available in three sizes, four polyester powder coated architectural finishes and a polished and brass plated finish. All Kickstop HingeGuard Plates offer superior protection and resistance against kick-in attacks and forced entry. 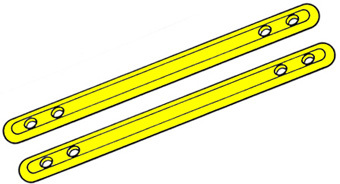 Supplied with 2 1/2" No. 10 woodscrews and fitting instructions. 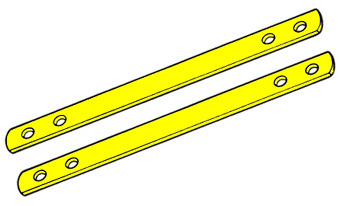 An enlarged drawing to illustrate HingeGuard Plates and a HingeGuard - click below.